Mistakes come in all packages. This one comes on a 5 x 11” piece of paper. The slick color direct mailer went out to 10,000 customers with a nice $5 coupon. The mailer trumpets a newly remodeled Applebee’s in Maple Grove, MN. Any marketing executive would tell you it’s a great and efficient “activation” driver to bring lapsed users into the restaurant. Tragically, the headline on the back of the mailer launches another driver: Buzz. And this buzz is not good. It speaks for itself. Applebee’s did not. interchange all of the words. When Fox 9 contacted the corporate spokeswoman, there was no apology and little explanation. My colleague Erik Runge, a good and seasoned reporter, was stunned. He inquired about getting an interview from someone at Applebee’s explaining the error and was denied. He then asked about getting a written statement and again—denied. There are some basic rules about crisis management. One of them is get ahead of the discussion. But the most important rule is to become a part of the discussion. Applebee’s corporate silence is equivalent to sticking its head in the sand. By not becoming a part of the narrative, they let everyone else—including their customers and the media—create the narrative for them. Once that happens, they have lost control of their brand. 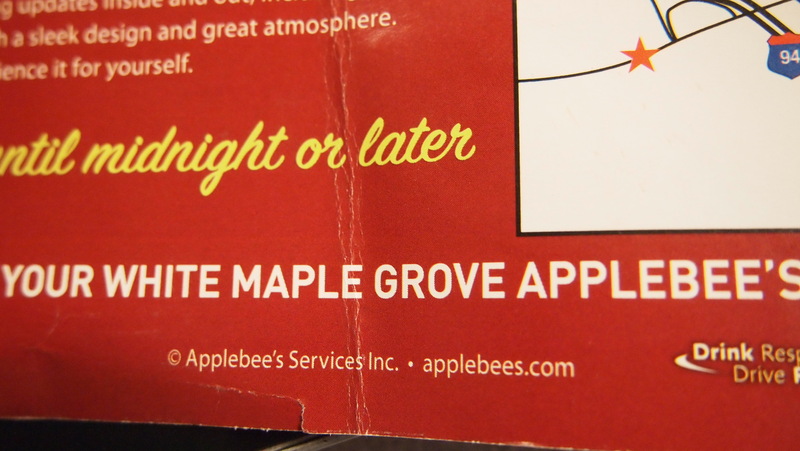 Those of us who are Applebee’s customers know it as a good neighborhood restaurant chain with great service. The tragedy is it’s painfully obvious that the spokeswoman in the corporate office is not committed to the brand or its soul. She needs to be force-fed some PR soul food. And then she needs to be fired. ← When Great Brands Tell Us “Don’t Worry, Be Happy.” Coke Does It Again. I will ensure that I bookmark your blog and definitely will come back down the road. You definitely put a fresh spin on a subject that’s been discussed for years. Wonderful stuff, just great! Thanks for the note. Please feel free to quote away. Wonderful items from you, man. I have keep in mind your stuff previous to and you are simply extremely magnificent. take care of to stay it sensible. I can’t wait to read far more from you. Thank so much for your thoughts and feedback. I’ve been pre-occupied with other commitments recently, but I will try to post more content. Thanks so much for the observation, I appreciate the heads-up.